This bar set is perfect for your home bar or at parties. 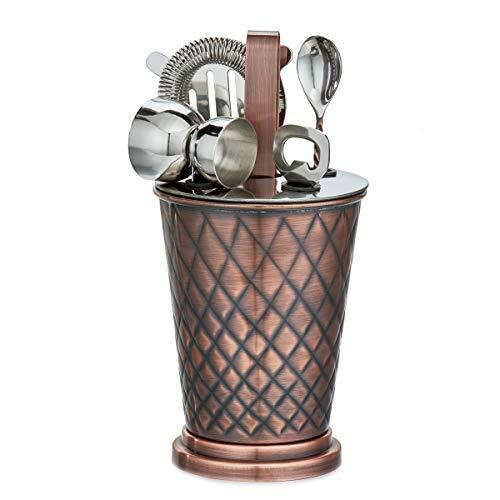 Designed with durability and elegance in mind, this set is constructed of durable stainless steel with an Embossed Antique Copper finish. Each set includes an ice bucket, a bottle opener, strainer, double jigger, tongs and a stirrer – all must have items when serving your favorite drinks. This Diamond Bar Set will be a staple of your bar for years to come. All tools can be placed comfortably in the lid fitted on top of the ice bucket. This presentation makes for a beautiful décor piece when items are not in use.